A 9-year-old boy was recovering Wednesday night after being shot in East Oakland while out walking his dog with his family after they had celebrated his birthday Sunday. The shooting was reported in the 2700 block of Fruitvale Avenue at 10:56 p.m., according to police. Isai Catalan was taken to a hospital after he suffered gunshot wounds to his leg and torso. A GoFundMe page was set up by the family's church to help cover the cost of the boy's medical expenses. The campaign had exceeded its $5,000 goal as of Wednesday afternoon. 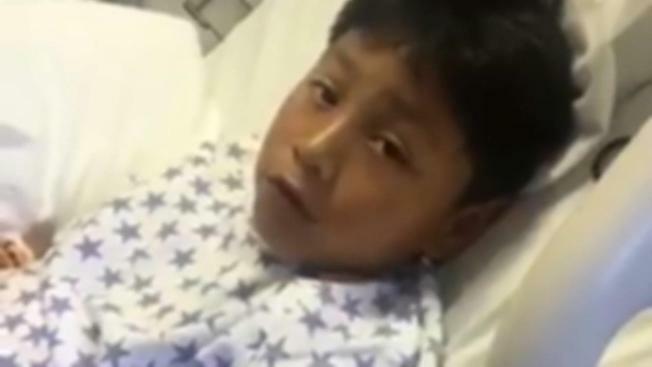 Isai was listed in stable condition at UCSF Benioff Oakland Children's Hospital as of Tuesday afternoon, according to a Facebook post from the Oakland F.C. Leopards, a youth soccer team Isai was a part of. The Leopards coach on Wednesday huddled with the team to give them an update on Isai's condition and urge them to rally around their teammate. "This is one of those moments it’s super important that we as a team help each other out," he said. The soccer club took up a collection of donations and sent a giant card and signed soccer ball to Isai. Later Wednesday, with his pastor at his bedside, Isai sent out a message: "Thank you all for your support. God bless you." Police said the boy was not the intended target of the shooting and that a suspect remains at large. Anyone with additional information is asked to call the Oakland Police Department's felony assault investigators at (510) 238-3426.